As horse archery gains popularity in the UK, where can beginners go to learn the basics and serious students go to hone their skills? 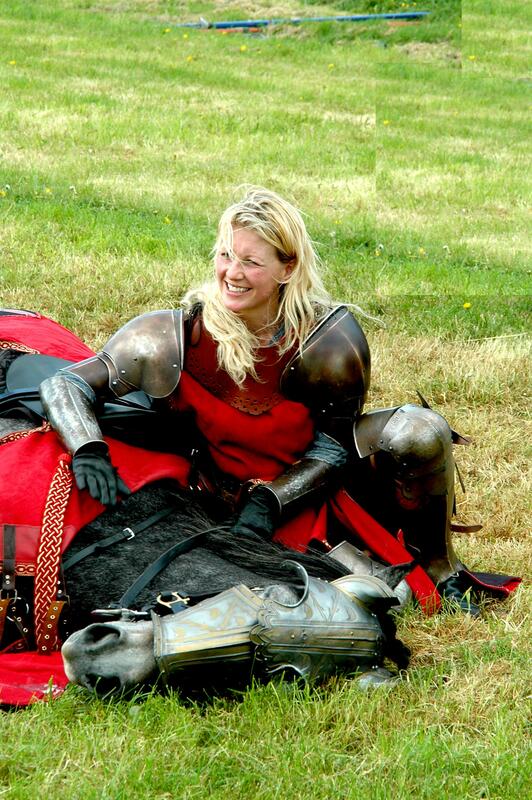 The Centre of Horseback Combat in Sussex offers not only archery on horseback but also jousting and trick riding training. Horseback Historian talks to Zana and Karl of the Centre exclusively for www.historyonhorseback.com and learns that as with other equestrian activities, trust and bonding is the key to success. Horseback Historian: First of all, Zana and Karl, tell me a little about your background with horses. Zana: My first involvement with horses was when I was about 6 or 7 years old, riding at a riding school; but as I was training in ballet at the time I was not allowed my own horse. I pestered my parents and eventually they gave in when a horse, which I was helping to look after locally, came up for sale. My first horse was an Arab x Welsh gelding called Roscoe. Even at that stage I used to pretend I was Indiana Jones and ride my horse down steep banks and gallop everywhere as if I was in the movies, and I was always trying to vault on in different ways! I still did the regular Pony Club type stuff and local cross country events, but I knew this is where I was happiest: down the stables with my horse. I also knew that this was an area I’d like to work in. If I could combine the two passions of performance and horses then I would really be living the dream! Karl: My background is mainly in driving horses and horse logging. My first horse was a heavy cob called Trojan. We pulled wood out of difficult woodland areas (in Cumbria this is called “snigging”) and also worked for a charcoal burner in Cumbria. Then, with Zana, I went on to work with a jousting team. All these varied skills have made a contribution to our business. Horseback Historian: When did you set up your company and what inspired you to do so? Zana: We have two companies, The Stampede Stunt Company and The Centre of Horseback Combat. The first company, Stampede Stunt Company, is our show and production company that goes out and about all over the country giving jousting and trick riding displays and horse archery demonstrations. We travel the length and breadth of the UK performing at castles, county shows, Medieval Fayres, schools and many other events. 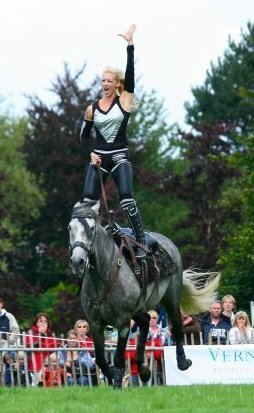 We started Stampede Stunts around four years ago after working in the business for the last ten years with other stunt horse teams. We knew the type of shows we would want to watch ourselves and what an audience is looking for and so we decided to create our own team! Karl: The Centre of Horseback Combat is our teaching centre at home. This came about around two years ago as we kept meeting people backstage after the shows who asked where they could learn this stuff and we realised there was a market for it. The horse archery particularly is an area we really wanted to develop. We decided to create this centre of excellence where people could come and learn this amazing and beautiful sport. We also wanted to do it properly, to create an excellent facility for learning. We had seen enough people try to set this kind of facility up without proper thought, and indeed, illegally, without proper insurance cover or a riding school license to teach at their yard. We wanted to change that: our customers are safe, on good teaching horses and are able to come to a fantastic learning facility. Zana: I really wanted to promote horse archery. We saw some horse bows for sale at some Medieval events where we were performing but when we wanted to learn, we couldn’t find anyone who was teaching horseback archery. In fact, I hadn’t really heard much about it at all. I just thought the bows were beautiful and the imagery stunning. We eventually found someone who, by amazing coincidence, only lived three miles away! Yes, it’s strange but true. We had a fantastic day there but there wasn’t really a professional facility to visit. That gave us an idea for a new direction. We wanted to make sure we could get the insurance for teaching first. That took two years, but we were persistent and focussed and achieved it in the end. We had the green light! Horseback Historian: What training and other services do you offer your customers? 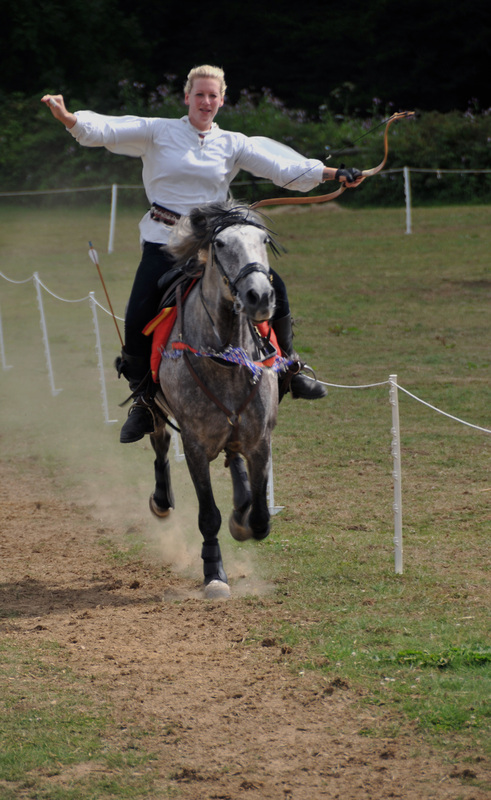 Zana: We offer courses in learning to joust, learning horseback archery and learning stunt riding such as Cossack trick riding and Roman riding (the art of standing on the backs of two horses whilst they gallop along!) We also offer a Horse Confidence course for nervous riders wanting to gain some confidence in the saddle or around horses and also for riders wanting to push their skills further. People can come for a full day and have a lunch in our clubhouse. We also offer half day courses and two hour training sessions in each of the skill areas for people wanting to train more regularly. Horseback Historian: Where did you learn your skills? Zana: My background was in dance and ballet. This has helped me in everything I have decided to do. It gave me discipline, core strength and flexibility. All important things in a stunt rider. We then went on to work together, at first performing a trapeze act, which then led us to work as performers at a Medieval Castle for the summer. We worked alongside a jousting team who jousted 5 days a week there. We landed jobs with the team: Karl presented for them and I was squiring, which is a starting point for all wannabe knights! Through the jousting team, I was lucky enough to find a job at Warwick Castle playing the only female knight amongst five guys, jousting for the whole summer. It has gone on from there. I developed my skills as a trick rider as the role also required me to trick ride each day. We performed seven days a week, two shows per day! Karl also learned to joust and trick ride and together we bought our first stunt horse, Sputnik, who was a flashy Welsh Section D.
Horseback Historian: How many horses do you have? Tell me a little about them. Is there one breed or type that excels in your work? Zana: We currently have six trained stunt horses here at our centre, but we are looking out for more to join the team. We love the Andalusians, they are great horses for the job. They tend to be quick learners, brave, curious and flashy for the show ring. Any Iberian type or breed can be great. We also have a Lipizzaner here. I like Friesians for their look and build; they are great for jousting. For trick riding we would go for a smallish type, say around 15hh to 15.2hh, with a flat stride and a medium fast speed. Karl: Also, medieval war horses were not the big fellows that people today generally think they were. They used weight carrying, smaller horses of around 15hh, for both jousting and battle. 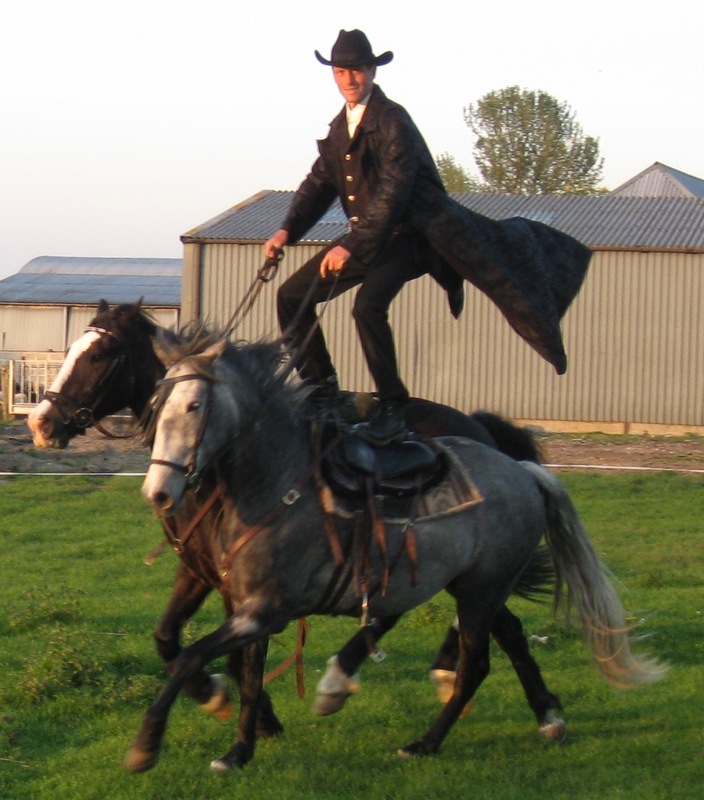 Horseback Historian: What do you think motivates people to train to do stunts, jousting and archery on horseback? Zana: It’s exciting! Some people are aiming for a career as stunt performers in films and TV. Some want to joust to fulfil a dream of being a knight in armour for the day. 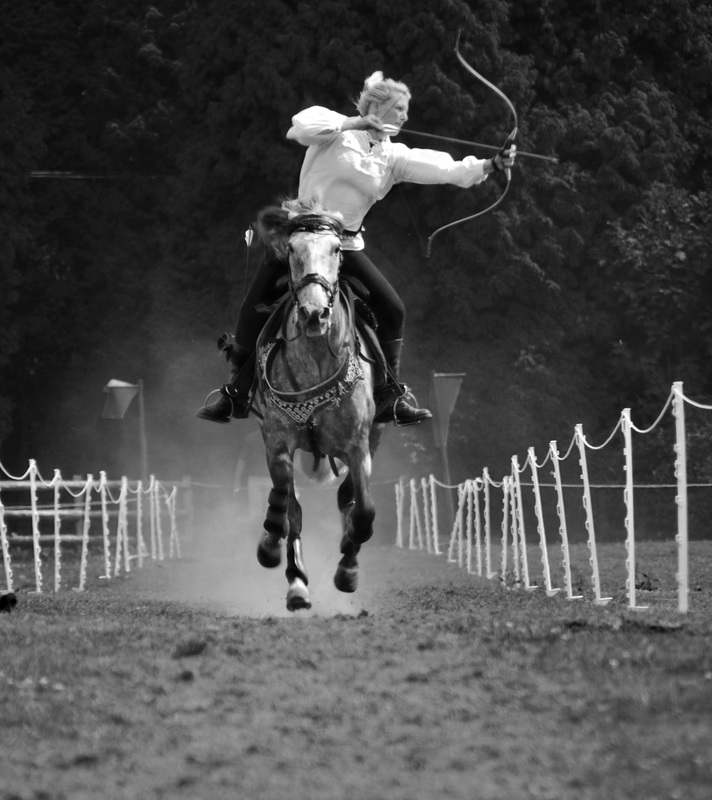 The horse archery is a real sport and can take people to competitions around the world if they focus on it. And so, some people come to learn the skill of shooting a horse bow, to practise the technique to an accomplished level. We find that for some people, horse archery can be addictive and even has a spiritual aspect. We also have a lot of people with an interest in history attending our centre. Some of our students have competed at the World Horse Archery Championships in Korea this year. Horseback Historian: How far do they travel to train with you and what’s the age range? Zana: We have customers from all over the UK as there aren’t many places teaching these skills. We are, in fact, the only centre dedicated to horse combat training in the country. We recently had some students from Switzerland who came here to study horse archery. We have found that, further afield, the level of interest is higher: this isn’t really for a local market, many people travel from quite some distance away rather than locally. Age wise…fifteen years and upwards – so far there isn’t an upper age limit! It’s down to the individual’s own fitness and strength to draw a bow or carry a lance. Horseback Historian: When it comes to your jousting and other displays, how historically accurate are they? Do you spend time doing research? Zana: I love spending time looking at costumes on Google Images and finding fabrics that are pretty historically accurate. I like to keep the colours a little muted as the dyes they used then wouldn’t have been really bright like those of modern colours. I tend to source my fabrics in America. They seem to have a better choice. 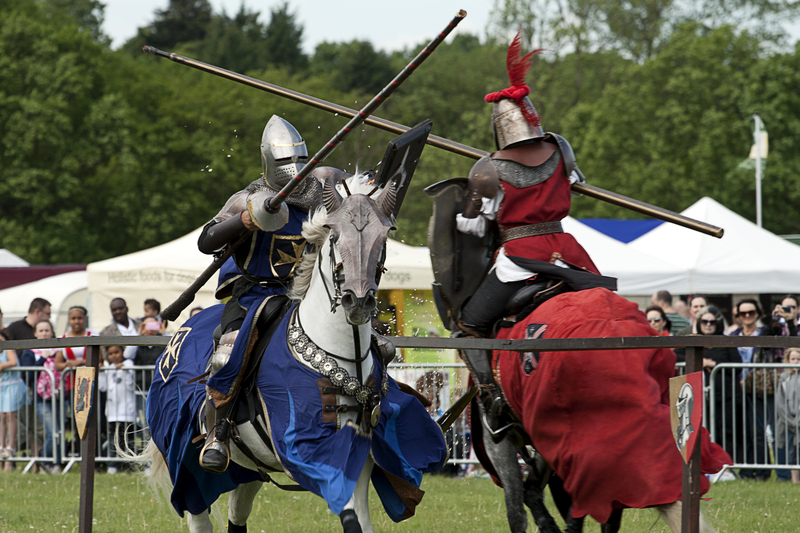 Our jousting knights use names that can be traced back to medieval times. They really did exist! I play a female knight and even that is accurate: there was “The Order of the Hatchet”, an order of female knights from Spain, and so they existed too. The armour is based on examples from the 14th – 15th centuries and the horses are types that would have been used then. Andalusians were considered to be royal horses and only imported into other countries for use by the rich. For our horse archery displays, we use bows based on originals, we talk about the history of horse archery and the styles and types of bow that we use. We also add atmosphere with appropriate music, sometimes from modern film scores such as that for the movie “Mongol”. 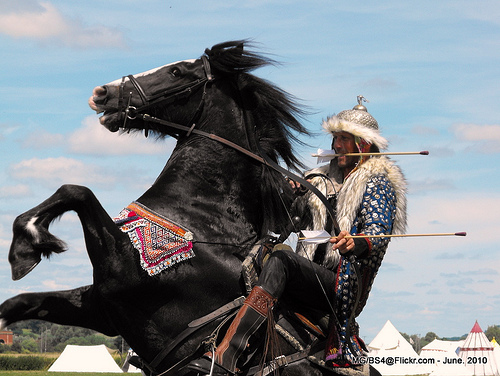 Horseback Historian: What is the most difficult aspect of teaching people to joust, to do archery or trick riding? Zana: It takes time to learn to shoot a horse bow and people have to allow for this. We also use the thumb draw, which many people, even those with archery experience, have not seen or tried before. The bows are plain and simple, which can throw a modern archer who, say, shoots a compound bow or an Olympic recurve bow and is used to gadgets and sights. Our style is instinctive. On a horse there is no time to aim: it’s all done by feel. We use a lot of techniques that conventional archers would not be familiar with, such as blind nocking and speed shooting. You need to learn to shoot as many arrows off as fast as you can! It takes a deal of patience at times to help someone struggling to grasp the technique in order to move forward into the activity; and then finally to put them onto a horse to practise shooting with the bow. Once they have really grasped the technique, you can see them really getting into it and then becoming competitive. It’s great to see someone who starts the day never having previously shot an arrow and ends it by shooting arrows from a cantering horse, with a degree of confidence. 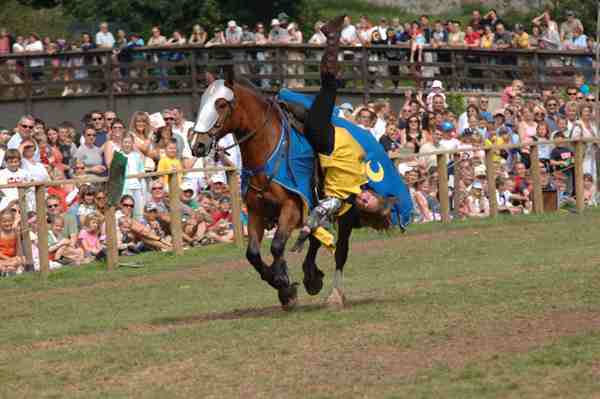 Karl: The jousting can be quite difficult to learn as the lances are pretty heavy. People expect you to give them a light pole, but we use a lance of the correct length and width. Learning to ride and control a horse with only one hand on the reins can be tricky at the start. When you’re also given a shield, it’s even harder as that’s held in the same hand as the reins! Meanwhile you are holding an eleven foot lance in your right hand. It helps to have a good, well-behaved horse – it almost does the job for you, taking you down the jousting tilt and stopping at the other end. Having no vision in a helm takes some getting used to as well! Zana: Trick riding requires great strength and courage. You need to be gymnastic and flexible. We usually ask someone coming for lessons whether they can do fifty sit-ups, fifteen press-ups and three to five pull-ups, varying the requirements depending on whether they are male or female. It gives us an idea of their strength. It takes a few years to get really competent, certainly if you want the possibility of performing to a good standard in shows. Horseback Historian: Much of your day will probably parallel that of the regular horse owner in terms of care and management. Do you have any tips, acquired through experience, for the ordinary horse owner when it comes to keeping their own horses in excellent condition, particularly for those who want to practise archery on horseback? Zana: We do like the horses to get plenty of “down time” and turn out time. We also welcome new experiences for them. For example, if someone has a lawn mower running, or wants to do clay pigeon shooting nearby; we don’t mind as it acclimatises the horses and desensitises them to strange noises and goings on. We never ask people to stop an activity just so that the horses can walk past. I’d rather let the horse deal with it and understand that it’s all fine. Karl: Our horses do a mixture of activities and so they don’t go stale. One day we might be doing horse archery and the next, jousting; then we’re off to a show and when we come home we will let them relax and play in the field. We check their backs regularly for any early signs of tightness and soreness and treat them if we need to. Zana: We keep them in good condition and they all have healthy, shiny coats. I think our horses have a great and varied life. We have a great bond with them and this helps the horse to work in tune with us. Trust is everything!